There are many different kinds of fats, but each is a variation on the same chemical structure. All fats are derivatives of fatty acids and glycerol. Most fats are glycerides, particularly triglycerides (triesters of glycerol). One chain of fatty acid is bonded to each of the three -OH groups of the glycerol by the reaction of the carboxyl end of the fatty acid (-COOH) with the alcohol; I.e. three chains per molecule. Water is eliminated and the carbons are linked by an -O- bond through dehydration synthesis. This process is called esterification and fats are therefore esters. As a simple visual illustration, if the kinks and angles of these chains were straightened out, the molecule would have the shape of a capital letter E. The fatty acids would each be a horizontal line; the glycerol "backbone" would be the vertical line that joins the horizontal lines. Fats therefore have "ester" bonds. The location of the tissue determines its metabolic profile: visceral fat is located within the abdominal wall (i.e., beneath the wall of abdominal muscle) whereas "subcutaneous fat" is located beneath the skin (and includes fat that is located in the abdominal area beneath the skin but above the abdominal muscle wall). Visceral fat was recently discovered to be a significant producer of signaling chemicals (i.e., hormones), among which several are involved in inflammatory tissue responses. 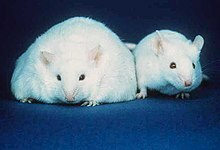 One of these is resistin which has been linked to obesity, insulin resistance, and Type 2 diabetes. This latter result is currently controversial, and there have been reputable studies supporting all sides on the issue. Dietary consumption of fatty acids has effects on human health. Studies have found that replacing saturated fats with cis unsaturated fats in the diet reduces risk of cardiovascular disease. For example, a 2015 systematic review of randomized control trials by the Cochrane Library concluded: "Lifestyle advice to all those at risk of cardiovascular disease and to lower risk population groups should continue to include permanent reduction of dietary saturated fat and partial replacement by unsaturated fats." ^ "Macronutrients: the Importance of Carbohydrate, Protein, and Fat". McKinley Health Center. University of Illinois at Urbana–Champaign. Retrieved 20 September 2014. ^ "Introduction to Energy Storage". Khan Academy. ^ "The human proteome in adipose - The Human Protein Atlas". www.proteinatlas.org. Retrieved 2017-09-12. ^ "Fats and Cholesterol", Harvard School of Public Health. Retrieved 02-11-16. ^ Harcombe, Zoë; Baker, Julien S.; Cooper, Stephen Mark; Davies, Bruce; Sculthorpe, Nicholas; Dinicolantonio, James J.; Grace, Fergal (2015). "Evidence from randomised controlled trials did not support the introduction of dietary fat guidelines in 1977 and 1983: a systematic review and meta-analysis". Open Heart. 2: e000196. doi:10.1136/openhrt-2014-000196. PMC 4316589. PMID 25685363.